It was during suppertime on Saturday, June 2, 2018, when the life of an inmate almost came to a panicking halt. Attention was drawn to an inmate choking in the dining hall, but with the swift moves from a well-prepared deputy, the offending morsel was dislodged and the man was saved. Deputy Escamilla, who worked chowhall security, looked toward the source of commotion and immediately noticed the inmate displayed signs of extreme distress. He saw the 36-year-old man gesture he was choking by holding his hands to his throat, and saw his complexion turn purple. Without hesitation, Deputy Escamilla performed the Heimlich Maneuver and administered several abdominal thrusts to dislodge the obstruction. The obstacle was ejected and, thankfully, the man began to breathe on his own. He was able to walk out of the room on his own and was treated by professional medical staff as a precautionary measure. 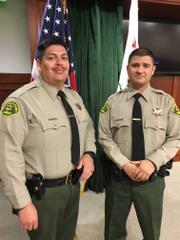 When asked about his reaction to the emergency, Deputy Escamilla said he remembered the Heimlich Maneuver Procedure from training he completed as an LASD Explorer, during his Deputy Sheriff Trainee Academy and during a recent refresher training course. 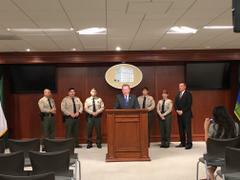 The inmates who observed the lifesaving event were very grateful and even applauded Deputy Escamilla’s actions. The heroic deputy said the inmate later thanked him for his assistance, but Deputy Escamilla was just glad he and his partners were able to assess the situation and use their training to handle a dire event quickly and successfully.